We at Term Team EZLife have been telling clients for years, that if you have an Medicare Advantage plan, put your Medicare card in a safe place – at HOME! That’s because, as most of you know, your Medicare card used your Social Security number followed by a letter to identify you. This has always presented a real threat to your identity if the card is ever lost or stolen. In the past, if you have a Medicare Supplement plan, you had to present both cards to your doctor’s office for billing purposes. That has all changed! Medicare is preparing to stop using Social Security numbers for identification next year and is sending new cards to patients with Medicare ID numbers. The move is required by a law enacted two years ago to discourage identity theft. The Centers for Medicare & Medicaid Services (CMS) recently updated its web page to help healthcare providers prepare for the change. 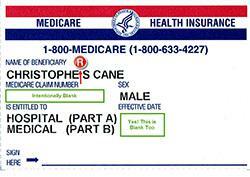 The agency began mailing the new cards with Medicare beneficiary identifiers (MBIs) back in April 2018. During a transition period through 2019, providers can use the MBIs or health insurance claim numbers (which are based on Social Security numbers) on transactions such as billing and claims. The 2015 law, the Medicare Access, and CHIP Reauthorization Act, requires CMS to remove Social Security numbers from Medicare cards by April 2019. AARP’s Fraud Watch Network ambassador, Frank Abagnale, advises consumers not to share Social Security numbers unnecessarily. “And don’t carry your Medicare card unless you are on your way to a health care appointment,” he wrote last year. “Instead, make a copy and black out all but the last four digits.” The new Medicare cards using a random set of numbers will hopefully eliminate the need to take such safeguards and provide seniors peace of mind that they won’t need to worry about this threat to their identity any longer. WANT TO LEARN MORE? GIVE US A CALL (760) 247-7990.